When Tricia Holman visited my Guild to give a talk and workshop I didn’t think much of it. I knew Tricia carries on a knitting tradition begun by her aunt Elizabeth Zimmermann (EZ). What I couldn’t have known is how much my knitting would change as a result. 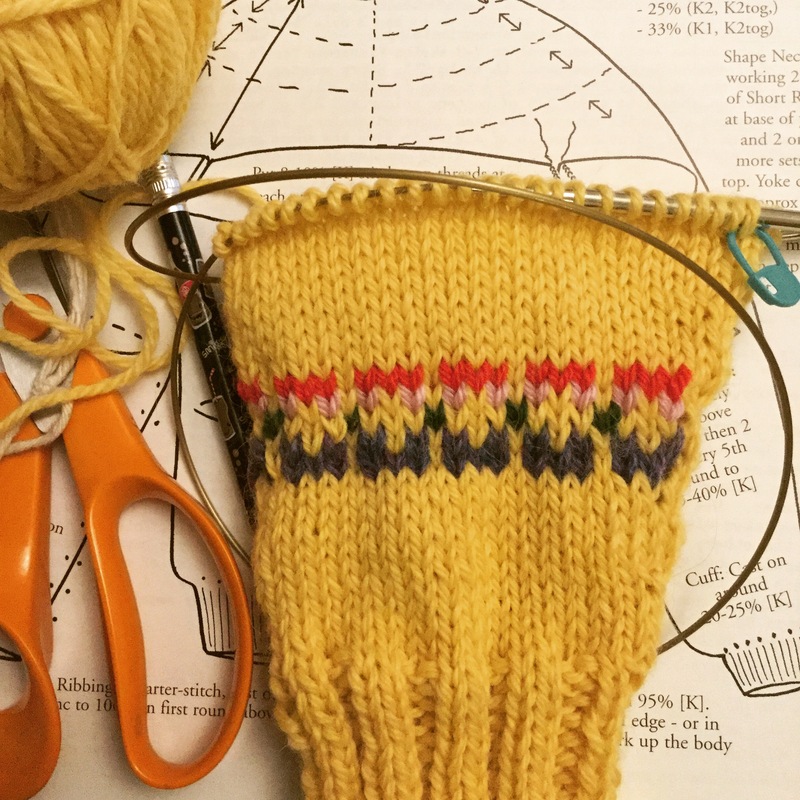 Tricia visited the Guild in February with piles of beautiful and creatively constructed garments and hats to discuss how her aunt’s approach to knitting influenced her own designs. 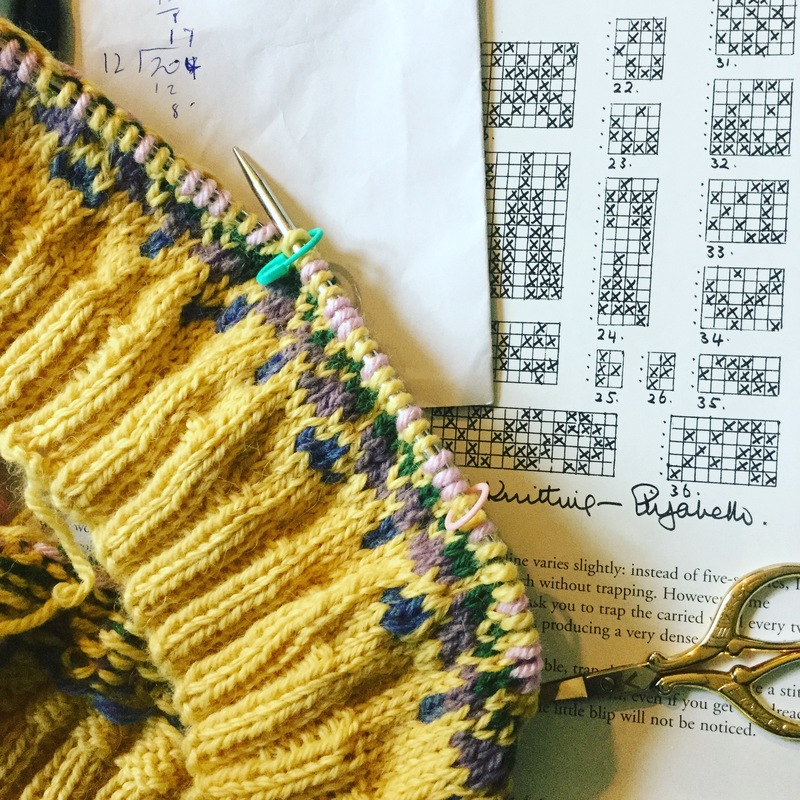 EZ, known as the grandmother of American knitting, is famous for her newsletters, a mathematical approach to knitting called Elizabeth’s Percentage System (EPS) and the “Surprise Jacket” patterns. Tricia noted that EZ’s knitting was deeply influenced by European traditions and that she was an advocate of Continental-style knitting (picking instead of throwing the yarn). EZ did not like purling and opted for knitting in the round or garter stitch patterns like the surprise jackets that have become a favourite with knitters around the world. That’s something else niece and aunt share. “I don’t like purling or sewing up. There are some who like it. What is so special about the surprise jacket is it’s really knitted origami,” said Tricia as she demonstrated how a single piece of knitted fabric could be folded into the surprise jacket. The guild members tittered in delight. If EZ wasn’t a fan of purling or sewing up she certainly was a fan of swatching and test knits. If you’ve seen her Knitting Workshop DVD there are some Sasha dolls on the set sporting little sweaters and hats. EZ herself is surrounded by balls of yarn and swatches. That’s because for EZ gauge is everything. That and figuring out how to knit smarter—bending the knit to her vision instead of the other way around. Again her niece Tricia has taken her aunt’s what-if attitude. Through swatching and testing she has her own EZ-inspired designs. 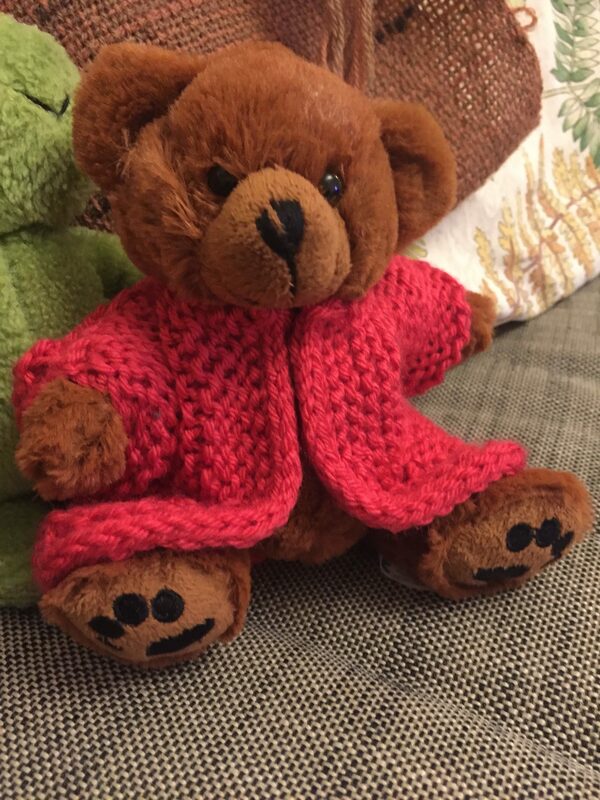 Tricia had many sizes and variations of the surprise jacket on show—from “very large nephew” size to tiny ones modelled by teddy bears. They showed the jacket’s flexibility. Just change the number of stitches or the gauge to change the size. At the workshop Tricia had us do a teddy bear-sized surprise jacket. I’ve knit a surprise jacket before and I still screwed it up. But if you’re only working on a mini version, then it doesn’t matter so much when you need to start over. Also, you can learn the technique before you jump in to start the real thing. Tricia’s other top tip was to make a swatch hat. Want to try out a new idea? Why not make a hat to see if it works. It’s a technique Tricia used for her own patterns including her Spiral Sweater. The Percentage System is a calculation for sizing garments based on gauge and desired body circumference. “EPS” consists of a simple mathematical formula to determine how many stitches to cast on for a sweater, based on chest circumference and the assumption that sleeves and body are usually proportionate no matter what yarn or gauge is used. Tricia’s message to spinners who knit was, you don’t need to follow patterns slavishly or be put off by sewing up (or even purling!). With a little imagination and some simple math you can easily make yourself a sweater that fits. Many of EZ’s patterns are based on EPS and are sort of a choose your adventure approach to knitting. She gives you a map. You do the rest. It will all work out fine–if you swatch. Knitting without a pattern had been out of the question for me, mainly because of lack of confidence, due to a longstanding laziness about swatching. I rarely swatched. I now realise that was dumb–especially for a spinner who knits. After a couple of hours with Tricia I was raring to go. I busted out my EZ’s Knitting Workshop DVD, my copy of the Opinionated Knitter and some yarn that had been lingering in my stash way too long. I cast on the body, did a little leaf fair isle pattern (more stash yarn!). Now I’ve done the body and a sleeve. Once I get another sleeve knitted then it will be time to dive into the yoke knitting. I love yoke sweaters and am excited for this step. Still thinking about what kind of pattern to use. In anticipation of my next EPS knit, I’m spinning up some yarn for a Gansey. Now that I know I can choose my own knitting adventure based on the gauge of the yarn I’ve made, well the possibilities are endless! Yay. I know we always have this discussion, but I like both purling and seaming, and yoke sweaters fit me oddly. But I’m a lazy swatcher, and the idea of testing gauge and pattern on a hat is a great idea. Like you said, if the gauge is off, it’s not that much to start over. Great post! Honestly I don’t mind purling or sewing up either. But I have always been wary of mods on the fly and fitting handspun to a pattern designed for commercial yarn has always been a headache. Now I feel like I’ve got more tools to do those things. I’m also looking forward to doing out more traditional knits like fair isle and gansey. I can pick and choose my motifs and put them on a sweater myself, using my handspun. Win! I’m sure you can use EPS for flat knits too. Purl and sew up to your heart’s content! Lol. You know that I will! I’m looking forward to seeing your ganseys. One thing I forgot to mention is purling is a nightmare when you’re doing fair isle. That’s when knitting in the round comes into its own. I also like it for other motif knitting like aran knits etc. Then you can use steeks and other techniques to avoid the yoke construction. I actually think purling is easier than knitting when doing any color-work. Maybe I’m doing it wrong, but I find having the working side facing me doing floats or intarsia makes more sense. Maybe I need to start working in the round with wrong side facing!